First of all, we need to announce the winner from our giveaway! The winner is #1334, Kelly! Congrats, girl! So as many of you noticed last week, we’re working with Kraft over the next month to bring you a whole slew of new (primarily dinner) recipes. Here’s the deal; our blog is a little sliver of our lives, but it comes from a genuine place. On Our Best Bites, you can find fancy food snobbery, you can find down-home goodness, you can find hints and tricks that have made our lives in the kitchen easier, you can find guilty pleasures, and you can find doctored-up recipes. And truthfully, honestly, they’re all things that we eat and cook and love and use. 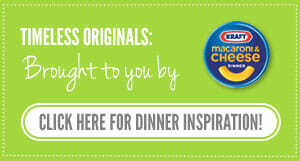 In the collaboration we’re working on, we’re doing 4 recipes featuring Kraft’s new macaroni and cheese flavors. This is the second, we’ve got two more two come. But we also have 6 brand-new from-scratch dinner recipes as part of this project that we haven’t even gotten to yet. We know that dinner is important, and we also know that it can be stressful, so we want to offer a wide variety of recipes to make dinner your kind of happy. So football season is right around the corner! I’m not a big watcher of football (unless Friday Night Lights counts, then I’m football’s most rabid fan. Go Lions! ), but I do love the food and parties. And for tailgating and game-day parties, you have to have buffalo wings and I’m pretty sure you have to have macaroni salad as well. 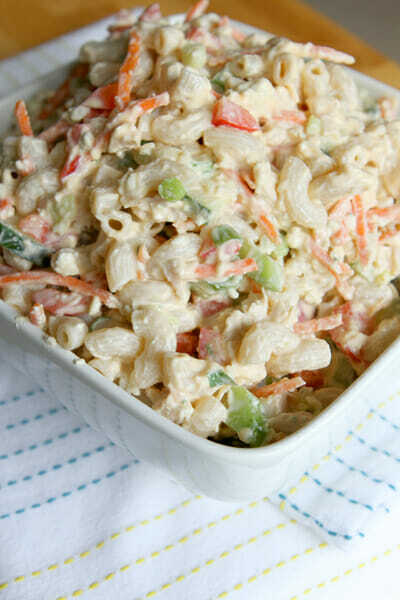 This macaroni salad is a twist on buffalo wings and macaroni salad. I started with Buffalo Cheddar Kraft Macaroni and cheese and then bulked things up with rotisserie chicken breast and crumbles of tangy blue cheese. Blue cheese can be hit or miss–sometimes it’s delicious and sometimes, even within the same brand, it can be overwhelmingly strong and musty-tasting. So if you find your heart racing and your palms sweating in the blue cheese department of the grocery store, I’m right there with you. Grocery store panic is no joke. But if you’re nervous about blue cheese, you can always use feta, which is a much milder, more consistent cheese. Cook the pasta al dente, disregarding the preparation instructions, but be sure to reserve the flavoring packet. 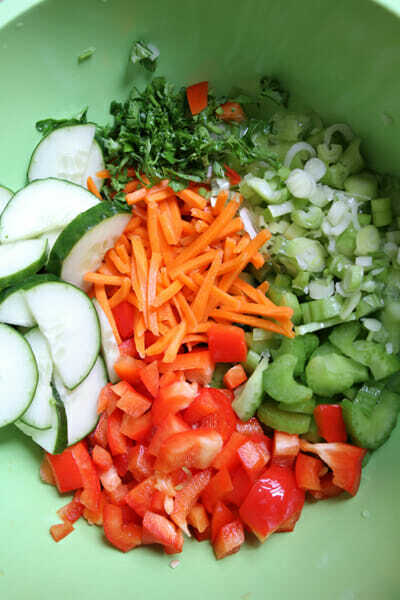 To fill the salad out, you’ll need celery, cucumbers, shredded carrots, green onions, and a red bell pepper. 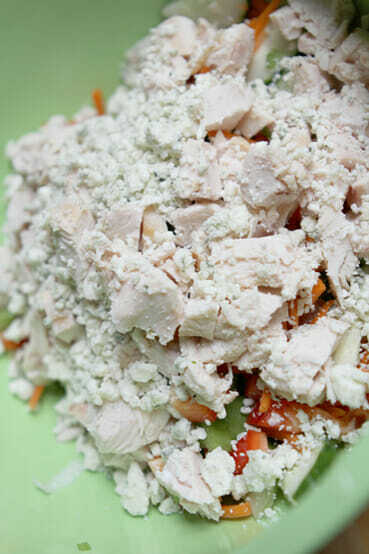 and add the pasta, shredded or chopped chicken, and blue cheese. 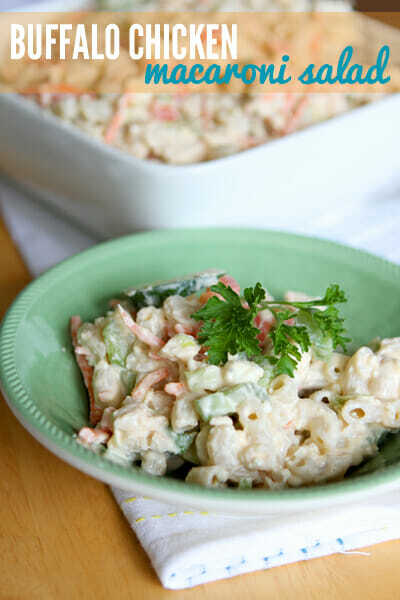 In a small mixing bowl, whisk together 1 1/2 cups of plain Greek yogurt or sour cream (if you want, you can use 3/4 cup plain Greek yogurt or sour cream and 3/4 cup mayonnaise), the seasoning packets for the macaroni and cheese, 2 teaspoons of red wine vinegar, and a clove of minced garlic. Add that to the pasta/veggie/chicken mixture and toss to coat evenly. If possible, refrigerate for at least an hour before serving. 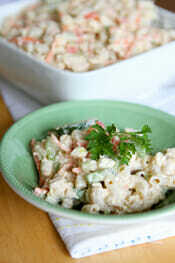 Makes 10-12 side-dish servings, 8-10 main dish servings. Cook the macaroni according to the package directions al dente. Set aside the seasoning packets. Drain the macaroni and rinse under cold water until the pasta is cool. 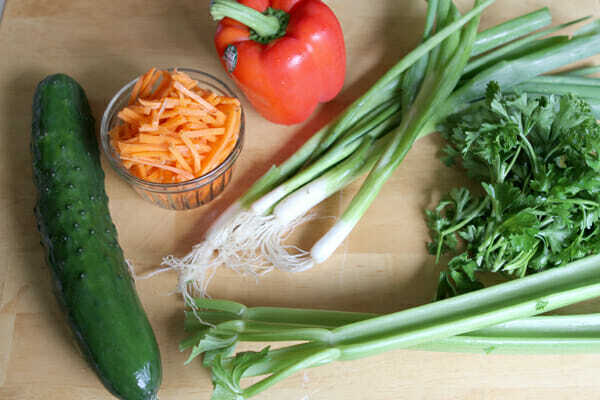 In a large bowl, combine the celery, cucumber, carrot shreds, green onions, chicken, blue cheese, and chopped bell pepper. Toss with the cooled macaroni. In a large measuring cup, whisk together the Greek yogurt or sour cream, the seasoning packets from the macaroni and cheese, the minced garlic, and red wine vinegar. 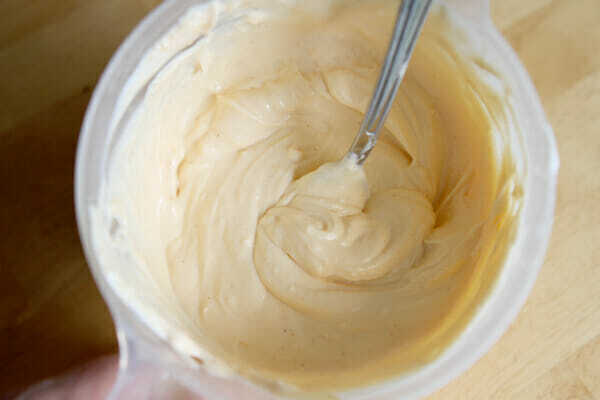 Add the Greek yogurt mixture and toss to coat. If possible, refrigerate for at least an hour before serving. Makes 8-10 servings. If you’re in a dinner rut, check out the Our Best Bites channel for dinner inspiration! I love any and all buffalo chicken recipes and this one looks awesome!! YUM! Yum! I love anything buffalo style! This looks pretty good! I also love your taquito recipe, but filled with a mixture of chopped up chicken, cream cheese, Frank’s red hot sauce, and shredded mexican cheese. Also awesome with ranch dressing (or bleu cheese) mixed in or for dipping, but since I never have it in the house we usually skip it. I just got a rotisserie chicken from Costco and froze a batch of those for later this fall! What a great idea! I’m sure this we be a hit at football parties this fall. Oh I LOVE the looks of this. The first football game of the season for us is this Saturday, and I’ll be bringing this. yum! looks great! love anything buffalo and love that it is using greek yogurt. not huge mayo fans here. might have to pick up some of these new american KD flavours when we’re across the border next! Looking forward to these great dinner idea posts, as the craziness of fall will be upon us soon! Over the last few years I’ve become a real fan of buffalo/blue cheese combos (I used to think I hated it!) So I love seeing these flavors in a variety of dishes! I am not finding these flavored mac and cheese packages in my local stores. Have they launched in all areas yet? This recipe totally caught my eye and I love everything about it, except blue cheese or feta. i hate both of those. Should I just omit the cheese or do you suggest a substitute? You could try cutting a milder cheese into very small cubes. Maybe colby jack or even mozzarella? So glad for recipes like this! I have a 19-year old son who recently moved into college housing and is “cooking” on his own for the first time. I e-mail him recipes like these so he doesn’t starve (or try to live on Ramen noodles alone!). Keep them coming and know that somewhere in Cincinnati, there are some very grateful college students! I’m not having any luck finding this type of Mac and Cheese in our area. We live in WA state. Do you know where I could find it? I did finally find the Kraft Buffalo Mac and Cheese in WA state. Found it at a local Walmart Supercenter. So if you have one of those in your area, you can check online to see if they carry product in store. I just finished making this to take to a tailgating party this afternoon. It is delicious! I found the mac n cheese at Publix. Thank you for another great recipe! I’ve never seen the buffalo Mac n cheese here in Canada, and we are too far from the border, so I just used regular noodles and about 2tbsp of franks red hot sauce and it tastes great. Thanks! Made this last night and it was super tasty! Thanks for the awesome recipes.